How many times have you been at your desk working when your mind begins to wander? You look out the window and dream of warm weather. Or think about the seemingly million tasks you need to finish in the next two days. These are examples of lost focus. It happens to everyone. It leads to decreased productivity, lower quality work and frustration. 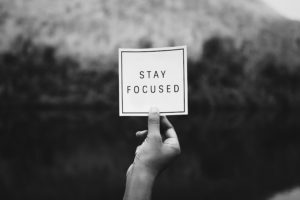 So, how can you stay focused? Here are four tips to help you. Prioritize tasks. Make a list of tasks in order of importance. Set aside blocks of time for each task. For example, from 9 to 10 a.m., answer e-mails; from 10 to 11 a.m., work on a blog. This dedicated time provides structure to complete those tasks. Leverage your peak time. Do your toughest tasks when you are most alert. Are you a morning person? Tackle your tough tasks during that time for increased productivity. Eliminate distractions. Silence your cell phone. Remove clutter from your desk. Close your office door. These simple tactics will help you focus on the task-at-hand. Take a break and reward yourself for a job well done. Make time for fun. When you accomplish a task, give yourself a nice pat on the back. Focus takes patience and lots of practice. “The biggest challenge is to stay focused. It’s to have the discipline when there are so many competing things.”–Alexa Hirshfield, Owner, Paperless Post.